Cristian Roldan heads the ball downfield for Seattle in the first period. Sporting KC played the Seattle Sounders in the 2016 season opener Sunday, March 6, 2016 at CenturyLink Field. 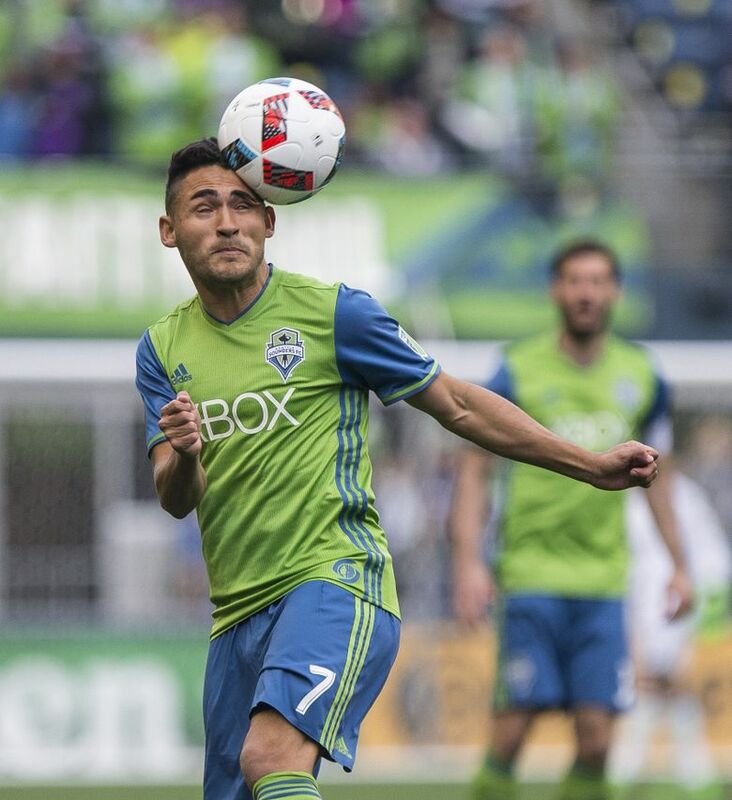 Sounders midfielder Cristian Roldan, who has represented the United States at the under-20 level, has attracted the interest of the Guatemalan and El Salvadoran national teams, Seattle coach Sigi Schmid said after practice Wednesday. That conversation is more complicated than which federation bats its eyes at Roldan first, however. And the international experience of Sounders teammate Oalex Anderson is instructive — not that the latter had too much of a choice in the matter. Anderson, who was born and raised in St. Vincent and the Grenadines, has earned 20 caps with its senior national team. He has scored against the United States in a World Cup qualifier and helped Vincy Heat — the national team’s nickname — into the fourth round of the qualification process. Yet if, in an alternate universe, Anderson had attended high school in the U.S. and was on track to earn his passport, Schmid said he would have counseled the young forward to be patient. Schmid said he has offered similar advice to Roldan. Guatemala is 95th in the FIFA rankings — St. Vincent and the Grenadines is 141st — and despite upsetting the No. 30 U.S. last weekend at home is back on track for an early elimination after getting routed 4-0 in Columbus, Ohio, on Tuesday. El Salvador is ranked 99th and in last place in qualification Group A.